Granite vs laminate kitchen countertop – comparison chart. Which kitchen countertop is better? Available in enormous variety of colors. Rich and beautiful natural look of stone. Each slab of granite is unique in appearance. Laminated countertops manufactured in enormous variety of colors, textures and styles. Excellent option for any kitchen. Good countertop for any kitchen design. Superb resistance to scratches. Practically it is nearly impossible to scratch the surface of granite countertop with kitchen knife. Fair resistance to scratches. Surface of laminate countertop could be easily scratched with sharp objects. Excellent resistance to heat. Hot pots or pans placed directly on granite counter won’t do any damage to stone. Granite is porous material which means different types of liquid can penetrate its surface and cause discoloring, but adequately sealed granite counter has good stain resistance properties. Laminate is non-porous material and impervious to stain. Granite is extremely hard and durable stone. Fairly durable material, but can be physically damaged. Granite cut from slabs certain dimensions. Normally length of a slab does not exceed 10 feet, but typically it is 8 – 9 feet long. 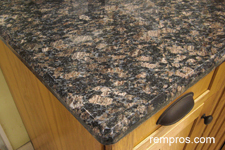 Practically it is impossible to make seamless granite countertop which is longer than 120 in. 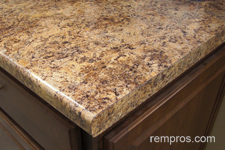 Professional stone countertop installers always hide seams as much as possible, but they are still visible. Depends on kitchen size. It is possible to manufacture tiny L-shaped 7’ x 5’ x 24.5” seamless laminate counter, but same as with stone, incorporation of seams is unavoidable while installing longer laminated countertops. Any type of kitchen sink from drop-in to Apron can be installed with granite countertop. Undermount sinks are not recommended for installation with laminate countertop. Normally laminate countertops last 20 – 25 years. Should be cleaned regularly and sealed periodically to ensure long lasting performance. Laminate is low maintenance countertop. Depends on thickness. Normally one square foot of 1 ¼ inches (3 centimeters) thick granite weight about 18 lbs (8.2 kg). Laminate is lightweight countertop material. Natural stone including granite is one of the most expensive materials for kitchen countertops. Granite prices greatly vary and mainly depend on color and country of origin. Some granite colors are cheaper while others might be nearly twice more expensive. Laminate countertop is one of the cheapest on the market. Labor fees for granite countertop installation are higher in comparison with laminate countertop installation. Majority of homeowners simply unable to cut granite to sizes, move and install heavy pieces of natural stone properly. For that reason, cost of granite countertop installed per square foot means price of stone itself, fabrication, delivery and installation expenses. Charges to install laminate countertop are significantly lower compare to installation of natural stone kitchen counters. Could be a challenging task, normally not for do it yourself installation. Easy to moderate difficulty kitchen renovation project. In-home installation of a new 35 – 37 ft2 U-shaped granite kitchen countertop normally takes a few hours for a crew of three. Depending on a number of orders and stone availability, total time from getting measurement to delivery and actual installation might range from 5 to 9 business days. Two carpenters normally are able to install L-shaped 30 – 34 square feet of prefabricated laminate countertop in 3 to 4 hours. Fabrication of custom laminate counter normally takes couple weeks after placing an order. Laminating countertop on site and actual installation is typically a couple days project. Scratches are extremely hard to fix. If water gets to the core layer the whole counter might need to be replaced. 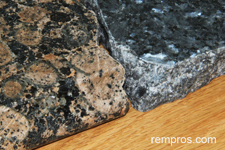 Omitting periodical sealer application might lead to stain spots appear on granite surface. Cracks are normally is a result of poor installation. Hot pots placed directly on laminate surface can easily damage the counter and burned spots are impossible to fix. Improper sealed seams or edges can let the water penetrate the surface layer and gets to the core causing warping and destroying the countertop from inside. 1Rating was estimated on the scale from 1 to 5, accounting 1 as lowest and 5 as the highest quality of a product. Always consider the fact: not all products made equally the same and performance of particular material significantly depends on individual product quality, adequate installation, and proper maintenance. 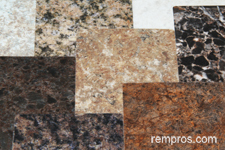 Granite and laminate are among most popular kitchen countertop options with their own advantages and disadvantages. Natural stone is a premium countertop and one of the best solutions for expensive, rich looking kitchens. It has longer lifespan and more durable compare to a laminate option. But low initial cost and easy installation process makes laminate counter very attractive to homeowners who are simply unable to invest much into kitchen renovation.